Independence Day is a public holiday in Dominica. It's celebrated every year on November 3, that is anniversary of declaration of independence from Great Britain. The process of colonization of Dominica started in 1632, when the French came to the island. The first permanent French settlements were established there in 1690. After the end of the Seven Years' War France ceded administration over Dominica to Great Britain and the latter established its control. During the period of British rule Dominica became the only colony with a legislature controlled by an ethnic African majority. In 1958 Dominica became a part of the British Windward Islands and joined the short-lived West Indies Federation of the colonies of the United Kingdom seeking for independence and establishment of the single state. 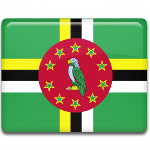 After the dissolution of the West Indies Federation Dominica became an associate state of the United Kingdom, thus formally taking responsibility for its internal affairs. The United Kingdom granted Dominica full independence on November 3, 1978. Celebration of Independence Day opens a whole season of cultural activities, lasting for four weeks. Some of the aspects include national dress, traditional music and dances, markets and national food.